6 p.m. Thursday, Nov. 30. Free, use the museum’s 7th Avenue entrance. Directed by Karen Weinberg, “Keep Talking” was shot in Kodiak and Anchorage over five years and follows the efforts of Alaska Native women as they work to preserve their endangered language. The film screening, in partnership with the Anchorage International Film Festival, will be followed by a panel discussion addressing issues of revitalization, historical trauma and recovery. Our other esteemed guest, Rebecca Pottebaum, Director of the Alaska International Film Festival echoed the use of film as a cultural revitalization tool. One film, is about a Sami rap artist, an indigenous person from Norway, where the Sami people face many challenges encountered by Alaska Natives. 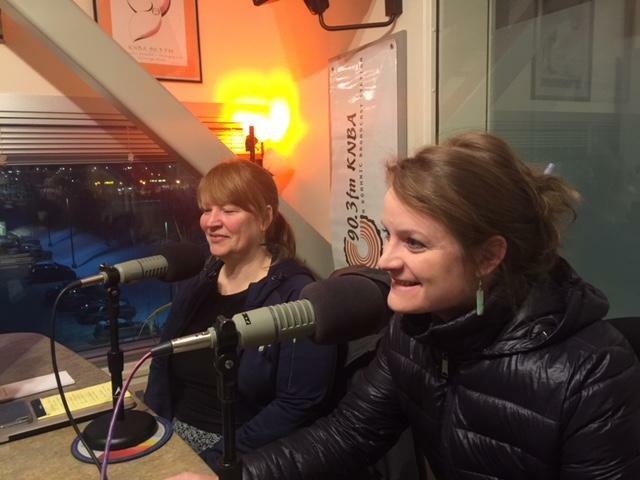 Angie Demma and Rebecca Pottebaum teamed up to talk about some amazing films right here in Anchorage - Keep Talking is screening at the Anchorage Museum Thursday, and the kickoff for the Anchorage International Film Festival is this coming Friday. A Juneau man making a film about historical trauma and Alaska Natives faces two challenges. First, he is terminally ill with A-L-S, or Lou Gehrig’s disease. Second, he’s getting criticism that because he’s White, he can’t do justice to the topic. Yesterday, Thursday, Dec. 17, 2015, Superior Court judge Paul Lyle approved a deal vacating the convictions of four men in the 1997 murder of John Hartman. In return, the Fairbanks Four promised not to sue the city of Fairbanks or the state of Alaska over the investigation and prosecution that led to their convictions, which they have long disputed.